Think of the Sequel as an urban Renegade, built to tackle anything Milwaukee can throw at it. SSD custom geometry and Reynolds double-butted 520 chromoly frame deliver a comfortable ride with maximum stability in every frame size. 650b wheels offer both the security of 12mm thru-axle mounting and the pot-hole-eating capability of high-volume 47c tires. 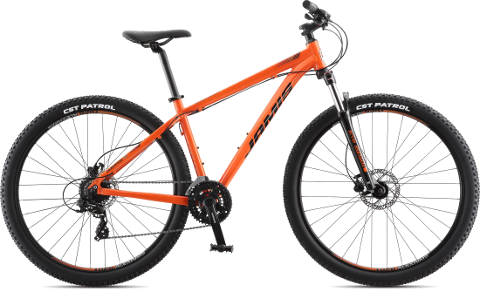 High-powered Shimano hydraulic disc brakes, a no-nonsense Deore 1 x 10 drivetrain and a ton of fender, bottle and rack mounts and the Sequel is clearly ready for urban assault no matter the surface or condition. This bike is for those looking to take their trail riding to the next level. With modern geometry, a 5” travel fork with thru axle and tubeless rims, the Hijack® performs as a capable all around hardtail. Lightweight and strong triple-butted 6061 series aluminum tubing, featuring over-sized & tapered tubing for increased frame stiffness. The increase in stiffness of a 15mm fork axle improves steering & handling significantly. It also puts less stress on the fork’s internals, improving fork durability and performance. The hub drop outs provide a self centering feature for the wheel for fast, easy installation. Designed with geometry like the Komodo, the Highpoint® is ready to tackle all aspects of trail riding. With a 5” travel fork with thru axle and tubeless rims, the Highpoint performs as a true all arounder. It’s a fact -- bigger wheels roll easier over stuff. Stuff like rocks, stutter bumps, mud and sand. In other words, they roll easier -- and faster -- over the trails you ride. Riding fast with control requires steering precision, which starts with the front of the bike. Stiffening this area results in less wheel deflection, more wheel control. A full 1.5” head tube and steerer would achieve this, but would add unnecessary weight and bulk, and limit stem choices. But a tapered 1 1 /8” to 1 1 /2” head tube serves up a significant increase in rough terrain tracking and stability without much of a weight penalty compared to standard 1 1 /8” systems. These may be the most affordable 29’ers in our shop, but there’s nothing entry-level about the performance of these bikes. Jamis has taken all new frame styling and married it to their proven XC geometry. The Durango frame features a sloping top tube that optimizes stand-over clearance while adding great looks at the same time. The over-sized down tube and head tube to offer plenty of strength, stiffness and fork crown clearance. Durangos feature a Zero Stack internal headset that places both the cups and bearings inside the head tube instead of outside. This reduces the total stack height (including the head tube), which is especially beneficial on big wheeled bikes. The larger diameter head tube also provides a larger weld interface at the critical head/top/down tube junction. Lightweight and strong triple-butted 6061 series aluminum tubing, featuring over-sized & tapered tubing for increased frame stiffness. The increase in stiffness of a 15mm fork axle improves steering & handling significantly. It also puts less stress on the fork’s internals, improving fork durability and performance. The hub drop outs provide a self centering feature for the wheel for fast, easy installation.